There are images from history books that stay with us: a group of women washing clothes together in the stream, a line of mothers walking with tall pitchers of well-water perched on their heads, babies wrapped tightly to their backs. Painting their faces and dancing around a fire. Gray haired women in rocking chairs sitting around a bucket shelling peas, shucking corn. Praying together, reading together, cooking together. Living in a modern culture that builds walls and fences around our kitchens and laundry rooms can make motherhood feel intensely isolating. So we reach out to see ourselves in others, to extend our view and break past the walls we build. To spend time outside ourselves, for us, and most importantly, for our children. 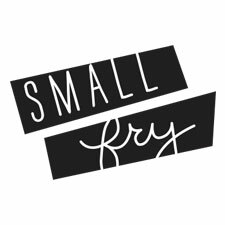 Small Fry is a declaration to ourselves and to our boys that every moment with them is a gift and also a choice. A choice to let the magic of childhood find us, and to look for it in everything we do. That the world is ours and there is adventure around every corner. To make the daily decision to look past the things we did not check off the list, but focus on the simple things we can do to illuminate our lives. To let the hard moments, minutes, phases, heartaches come when they may, but not break our stride or our desire to live vibrantly. Ladies, this is perfectly lovely. Bravo. Love this beautiful blog you guys! Wow! My goodness ladies! Loving the new blog so much and cannot wait for more! The photography is incredible! looks so beautiful! Can’t wait to follow along in the magic. Thanks Carla, happy you’re here! What a beautiful post- I love it! Such pretty pictures and gorgeous kids too. Looking forward to more! So happy to see this beautiful site. Every mother needs some inspiration. Thanks for making it a bit more accessible. What an amazing idea! I love it! I’m sitting here wishing I would’ve thought of something to blog about that revolves around family time. Truly, truly amazing idea, ladies! No blogging guilt here. Your kids will look back and be so grateful for their wonderful mothers! Beautiful idea, beautiful site. I’m so excited about this project! I love it! You’re all amazing. This couldn’t be more perfect. I’m going to need all the help and inspiration I can get in the mama department. Thank you for sharing your thoughts on of taking down the fences and being mothers of the moment. It makes the job so less daunting and enjoyable when you think of it that way. Excited for what’s to come! Thanks so much Helen! We’re committed to the cause, and glad to have you! wow ladies! that made me cry. living in a brownstone in brooklyn makes those walls seem even higher. can we all just live in a commune somewhere and hang our laundry on clotheslines while eating farm-fresh veggies? That’s what we say! Shoulda been Iroquois or something. Such a nice way to start a blog. Excited to see the community this can create. Love you girls. Thanks Ashley, we love you! Thanks Amber, happy to have you here! I am so excited about this. Can’t wait to see more! This is gorgeous! And such a wonderful concept! Great work ladies! I look forward to reading more. Should have just replied to all your comments at once, but oh well now you have a full inbox! We love that you’re loving it! Please keep the feedback coming! Love this blog!…Great job and I’m so excited to follow! “What if?” I love that! I’m obsessed with your motivation behind this blog. Something so good will change the lives of many mothers and their little tykes. Love to be acquainted with such brilliant women! Congrats it’s awesome. Tori! So happy you’re here. Of course motherhood is challenging, but like in all things, it’s all about your attitude. We’re happy we’re showing it in a new light for you. You’ll make the most amazing mother when you’re ready! Girls, y’all just made me cry sitting here in the pick up line infront of all these nice people! Love you guys and cheers to being mamas and all our little lovers! Aw, Kara! We love you! Looking forward to following this oh-so sweet site. Lovely pics and words too…go mama’s! Hooray! so excited to add small fry to my daily read! xo! we are excited to be added! thanks for stopping by. So lovely! Being the best Mom I can be is what my entire world is about. It will be so great to get ideas from your site and feel part of a group where other Moms feel the same! You guys are awesome, thank you! We are cut from the same cloth, glad to have you! i’m so glad i found you guys! i know i’ve been lacking in the awesome mother department- i want to be better and NEED to be better and this site is exactly what i need! 🙂 you mommas are beautiful inside and out. thank you so much for starting this!! we’re the same way, just trying to be better. thanks for reading! Thanks Melanie, we love you!! Great idea! I agree, and look excitedly forward to digging around more. Such a great and inspiring blog!! It is so easy to get wrapped up in the everyday nonsense-I’m off the do the footprint ghosts with my boys!! It’s so wonderful to see a group of women supporting and encouraging one another, in such a world where it’s easy to judge and defeat others, especially during such a tender time of life as early parenthood. Cheers to you and yours. May blessings continue to flow your way and to the lives you may touch along the journey. I hadn’t read this until today. Wow. It’s so beautifully written and such a reminder to live each day with the intention of savoring those little faces and those large eyes. I needed to read this today. Thank you and thank you for this rock star blog. It has a ton of great info! what a beautiful tribute this writing is to mothers all over the globe. i have followed you on instagram for a bit and this is my first time looking onto your blog. it is such a cheery place! as a mother of all boys this blog makes me especially happy to see other fun, stylish women raising wonderful little adventurers! Gorgeous blog! So refreshing to come across mothers with classic yet modern taste! Wow…. so inspiring. Thank you! Anything from the “sensual collection” brand is good. . . I have the silky yaki human not remy, its still pretty good. Hi there, simply changed into alert to your blog thru Google, and located that it is really informative. I’m going to be careful for brussels. and I’m taking a look ahead to touch you. Will you please drop me a e-mail? a two million dollar prize pool, while only running on micro-transactions. Knowing your role means understanding what objective your selected character should be fulfilling for the team, and working toward achieving that goal throughout play. You might also discover that an egg or two has been cracked open. Yes! Finally someone writes about australian popular fall fashion blogs 2013. I actually like whaqt you have obtained right here, certainly like what yoou are saying andd the way in which in which you are saying it.